VMware has announced another CBT problem. Just a reminder, this is not a problem that HPE can do anything about in Data Protector -- it's a problem with the APIs that VMware have supplied for HPE to use. If you are doing VEAgent backups of your VMware environment (which is quite common) and you have any incrementals scheduled (also quite common), and you are running ESX 6 (which is lots of people) and you are using CBT (which you really, really would want to do normally).... then you might want to be aware that (yet again) VMware have announced that your backups could well be painfully broken. Only do full backups. Hmm, that's a lot of data. Probably OK if you are going to a StoreOnce dedupe, but that's going to turn into a lot more tape. Turn off CBT. Ouch, that's going to hurt performance. Downgrade to ESX 5.5. I don't see anyone doing that. Using the DataProtector disk agent and automated disaster recovery module. This is actually cheaper (no extension licenses required!) and gets you both a file-level backup and an ability to restore a virtual machine from nothing. I recommend this as a better approach generally, but particularly now when we can't trust our VM-level backups. Apply the patch that VMware has now released. Migrate all your virtual machines to Amazon machine images. (Or Google, or Azure. Pity it can't be HP any more). It's inevitable -- eventually -- that the economies of scale of the large cloud providers will overtake your ability to run things in your own data centre. So why not start planning for it now? Use a different virtualisation solution. 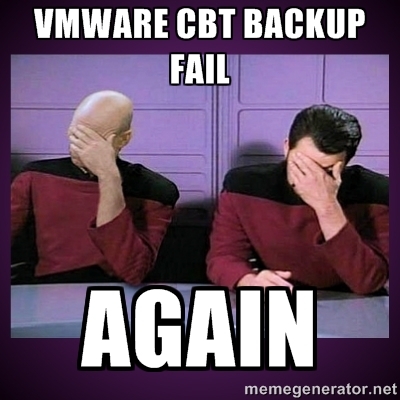 This is not the first time that VMware have announced "by the way, all backups are broken". I suspect it won't be the last time either. KVM is very mature now and it's also free. Xen is in good shape too. Virtualisation technology is no longer cutting edge -- it's commoditised now. So why not pay commodity prices?